These cookies and cream or Oreo cheesecake doughnut muffins are slightly sweet and creamy with a hint of chocolate from the cookie sandwiches. National Doughnut Day is coming this week, June 1st, so decided to make something that I have made before and is a big hit in my family, doughnut muffins. Doughnut muffins are light and spongy and its doughnut batter but baked in a muffin tin. They are not greasy like you can get with regular doughnuts but they still taste delicious. I made them for two post in two different flavors, Spiced Cranberry Orange Doughnut Muffins and cinnamon sugar and vanilla sugar Doughnut Muffins. I've always made two other post with Oreos, Oreo Cheesecake Cookies and Eggless Oreo Cheesecake Cookie Dough. I love the combo of Oreo and cheesecake so much because the cream cheese or the cheesecake adds flavor the the chocolatey sandwich cookie. 1. Crush cookies into medium crumbs, not too chunky but not too small. Set aside. 2. In a medium bowl, whisk together flour, sea salt and baking powder. Set aside. In a large bowl, with a hand mixer or stand mixer cream together sugar, butter and cream cheese until light and fluffy, about 3 to 4 minutes. 3. Add room temperature eggs, sour cream and vanilla extract just until incorporated. Then alternative between milk and flour. Starting with the flour and ending with the flour. Fold in the cookie crumbs until just combined. Reserve a little for topping to doughnut muffins. 4. Cover with clingwrap and let chill for at least 3 hours but overnight is better. 5. Preheat oven to 325 degrees and spray muffin tins with nonstick cookie spray or line with cupcake cups. Fill each cup 2/3 way up and bake for 25 to 30 minutes or until a toothpick comes clean. If the tops begin to brown fast, cover with foil for the last 5 to 10 minutes of baking. 6. Let the doughnut muffins cool in the tin for 10 minutes then remove to a wired rack and let cool completely.Store in a cool place. I have never seen oreos put into a muffin before! The oreos and cream cheese combo sounds so good! Really?! OMG... this recipe includes all my favorites... oreos, donuts and cream cheese. Bring on the pounds... it will be worth it. This is a must try! Thank you! I love it! It's a good combination and definitely something that I wouldn't mind making as a treat for me and my husband. Cheesecake and doughnuts as a muffin? YES PLEASE! I'm a huge fan of all three treats and I wouldn't mind having them all in one delicious muffin. It looks really delicious and I'm sure it's amazing with tea or coffee! Ooh I love the idea of Oreo cheesecake and doughnut! Today is National Doughtnut Day so that's reason enough to indulge I say! This sounds amazing!! An oreo cheesecake, and donut all in a muffin? I'm sold! This literally incorporates all of my favorite foods. I can't wait to make this! Omg this sounds so amazing! I need to try this soon, its all my favorite things rolled into one! I should totally surprise my husband and my best friend who is coming to visit me in a week with this recipe. They are both OREO CRAZY!!! Those look super delicious! I just learned that its national donut day and have been contemplating whether we should go and get some free donuts somewhere. I love this wonderful combination you have! Cheesecake is like my favorite! These look and sound so delcioius!!! I can't wait to try this one! All of my favorite things in one! I'll have to try these! They look delicious! Oreo + Cheesecake + Doughnut + Muffins sounds like a match made in heaven! These look so delicious! What a great idea to combine oreas and donut flavors into a nice cupcake or muffin. This ones really look good perfect to have with my coffee. I wish I could try one now. Oreos and cheesecake in a muffin, yum can't wait to try these. Wow! Those muffins look really good! I should try out this recipe soon. How did you fit all of my favorite things into one cupcake wrapper? These look fantastic! I plan on doing lots of baking with my girls this summer. Oo these look delicious! We love anything oreo in my house ! Whoa, whoa, whoa - four of my favorite things bundled into one? Amazing! All my favourite ingredients in one recipe! Sounds delicious and dreamy! Looks so delicious. I love baking so much. But I am minimizing it because I am gaining weights. But I should try your recipe. It looks healthy too. Thanks for sharing. Hooooly WOW this is basically a combination of everything I love. And they don't even look that hard to make. I was drooling reading this post. I'm excited to try the recipe out! this looks delicious! i need to get back into baking! This sounds like the ultimate muffin! I mean, OREOS are so tasty! Oreos and cheesecake in one muffin! That is something my dd would love to bake and all of us love to eat..
Those look so delicious. Oreo is one of my item to be used in desserts. Oh my goodness these look so absolutely delicious and amazing! I will make these for my kids! Oh my gosh!! These muffins sound amazing! I totally want one right now! These look amazing. I will pin it so I can make them for my family! What??!!! These look awesome! My kids would love them! you had me at oreo cheesecake! Yum! These look so delicious! These look and sound so delicious! A muffin and a doughnut, what more could you want? I will definitely have to try this for the family! These muffins look so yummy. I would definitely want to try one. Thanks for sharing. Those 4 things are already yummy individually- oreo, cheesecake, donut, muffin. Why are you torturing me by combining them all?!! Kidding. Awesome idea! Your recipes are always so scrumptious. Definitely will be saving this one for a later date. Thanks for sharing.! Oh my goodness! Did you say cheesecake? Anything with cheesecake I'm here for! Everything I love all in one! Definitely need to make these! These are getting all the ooos and ahhhhs from me today! What a creative and delicious idea! Love this! Sounds pretty good! I have never tasted Oreo muffins before, but would love to try them sometime! you had me at oreo and cheescake! Yummilicious! I love oreo cheesecake and this sounds yummy. I want one asap. Thanks for sharing. These beautiful Oreo cheesecake muffins look incredibly delicious! Thank you so much for sharing this fabulous recipe! Oh, sheesh. Way to murder my diet. :-D I cannot wait to try this! Oreos and cheesecake are an amazing combo. It’s alwas hard to say no. Can’t wait to try it! I love this. It looks so delicious. Thanks for sharing. Mmm, Yes! I love everything Oreo Cheesecake and these not only look delicious, but they sound like they'd be a hit here with the family! YUM!! This looks amazing. Mmm I love oreos. Going to whip up a batch this weekend! 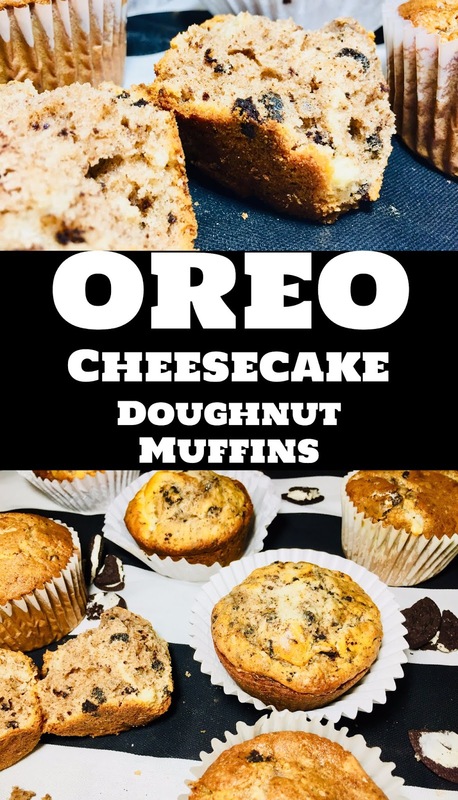 These Orea Cheesecake Doughnut muffins look and sound amazing! I love that they are so easy to make! I am going to make these for my daughter's sleepover this weekend. Somehow you've managed to combine four of my favourite things into a dessert - yum! Definitely adding this to the cheat day agenda.